Finally back the beloved appointment by melted cheese lovers: the Riavulillo cheese festival 2017 in Arola – Vico Equense! 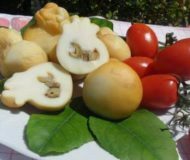 From July 30 to August 1, 2017, the small stuffed caciocavallo cheese will be the great star of the party. Musical entertainments for young and old are also available, as well as tastes of other local products. Possibility of parking in the area. Description: Finally back the beloved appointment by melted cheese lovers: the festival of "Riavulillo" 2017 in Arola - Vico Equense!